A few weeks ago I attempted to research where the notion that black people should take over the fried-chicken-commercial world came from. By “research” I mean I searched Google, of course. Even though I couldn’t find any information, I was given alternative search ideas, such as “black people love watermelon,” “black people love popeyes” and “black people eat chicken.” Needless to say, there wasn’t any Wikipedia article referencing when the love of fried chicken landed solely in the clogged arteries of black folks in commercials. But with today being #NationalFriedChickenDay (not even sure who came up with that one), let’s talk about fried chicken and advertising. About five years ago, Mary J. Blige came under fire for her modern-day shucking-and-jiving Crispy Chicken Wrap commercial for Burger King. It was reported that MJB was paid $2 million for the spot. Unfortunately, less than 48 hours after the commercial aired, it was pulled because people deemed it “racist” and inappropriate. Sure, it was a little over the top, with MJB screaming singing about chicken strips, but blame the advertising executives who thought it was a good idea. In the ’80s, advertising executives apparently thought that white people were giddy over fried chicken, because you were hard-pressed to find a commercial with black people in it. White people loved the finger-licking goodness, just like the next person. I’ll be the first to say, I love a piece of fried chicken as much as the next person, but what I don’t love is the stereotypical advertising that is now prevalent in most fast-food fried-chicken commercials. The first time I saw a full black cast in a fried-chicken commercial was with Ella Fitzgerald and a then-10-year-old Shanice—and of course I was able to find it on YouTube. Could this possibly be the first “singing for chicken” commercial? Those commercials can now be considered subdued compared with what we presently have in the form of chicken commercials. 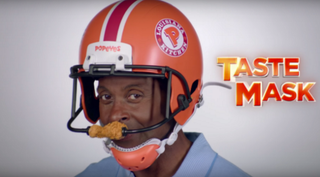 Even former football star Jerry Rice decided that nothing could stop him from getting a piece of that delicious Louisiana Popeyes fried chicken. But that commercial didn’t last too long after the backlash. So Jerry Rice clearly didn&apos;t think about what he was doing here. I’d like to know what goes through the minds of the people behind these commercials. Do they try hard to be stereotypical in depicting black people and their love of fried chicken? What’s next—a commercial with black people playing basketball, eating fried chicken during halftime and washing it down with some Kool-Aid, followed by a dessert that consists of watermelon? You’d be hard-pressed nowadays to find a fried-chicken ad with a nonblack person in it. I wonder if white people feel left out. Colonel Sanders is probably rolling over in his grave because he proved that white people loved fried chicken just as much as the next person. So on this #NationalFriedChickenDay, go out and enjoy your favorite piece of fried chicken, whether it’s KFC and their soggy fried chicken, Popeyes and their abnormally sized chicken breasts, or even some chicken strips from Bojangles. And maybe one day we won’t have to watch black people sing or be sassy in chicken commercials anymore.